2, 533 J. I. Case High School students began classes today. Case has the largest student body of all the Racine high schools. The J.I.Case High School Football Team played its season opener earlier tonight at Horlick Field and beat a strong Madison LaFollette team 19-8. 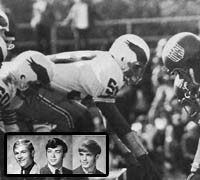 Case was led in scoring by senior halfbacks Dave Manderfeld, who scored in a 2 yard run and a 21 yard pass for Quarterback Ralph Porcaro, and Dennis Goff who scored on a 29 yard run. The is the first year of the South Shore Conference. 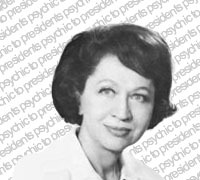 One of the nations leading Psychics, Mrs Jeanne Dixon, will be speaking this evening in the J. I. Case High School Field house. Doors open at 6:30 PM. Presentation is at 7:30 PM. Individual honors went to Park's Jim Hinchcliffe. With winds up to 25 MPH, the Senior Talaka was still able to defeat the Junior Talaka tonight in the Annual Powder Puff Football game 12-6 at Pershing Park. Led by Varsity Cheerleaders Pam Rossman, Jeri DiPasquale, Debbie McGregor, Patti Kirkegaard, Kelli Koltyn, Sharon Robinson, Carol Prochaska, along with cheers of hundreds of classmates, the Case Football team spoiled Parks Homecoming with a 29-6 victory this evening a Horlick Field. Case scoring came on 2 touchdown runs by Jim Sweers, a 27 yard TD pass from Ralph Porcaro to Jim Wimpress, Tom Gianforte on a 2 point conversion and a 20 yard interception run by Wendel Zirbel. Case is 5-1 overall and 2-0 in the South Shore Conference. Grammy Award winning group "The 5th Dimension" will present a concert in the J I. Case High School field house tonight at 8 PM. Tickets are available at the student activity office at UW Parkside. Tickets are $6, $5 and $4. Case defeated Janesville Parker in its football season finale earlier tonight 22-0. 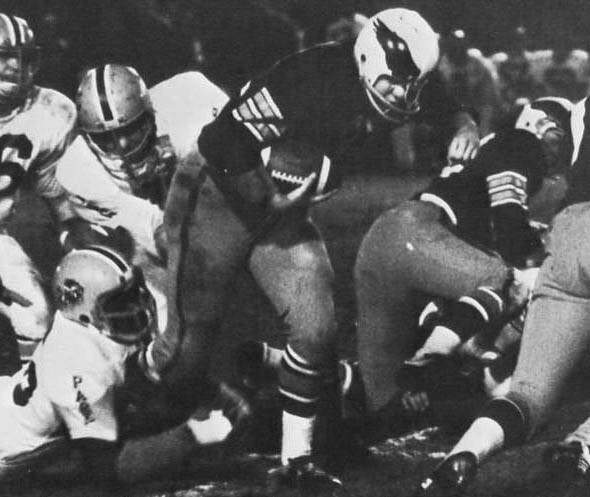 Case touchdowns came on a 79 yard pass from Ralph Porcaro to Jim Wimpress, a 4 yard run by Dave Manderfeld and a one yard run by Jim Sweers with Bob Stauss kicking the extra point. Case ends is season 7-2. J. I. Case High School Senior David LaFave, 17, son of Mr and Mrs Richard LaFave, 2512 Russet St., was named one of the three students as "Outstanding Youth of the Year" today by the two Racine Optimist Clubs. Also named were Lutheran Senior, Jayne Busarow and St. Catherine's Senior, William Troy. Case High School Senior Alfred Holter, 17, son of Mr and Mrs Arthur Holter, 5506 Marboro Drive, is one of 3 area seniors who have been singled out as part of the nations most outstanding group of high school English students. Also named were Martha Mihalyi form Burlington and Ralph Martens from Prairie School. The Case High School Swim, Basketball and Wrestling teams opened their seasons today with 2 out of 3 teams winning. The Swim team scored a 62-33 dual meet triumph over New Berlin. 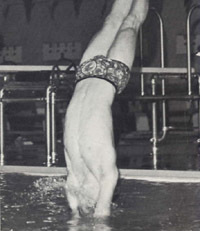 Ken Sorenson won the 100 and 200 yard Freestyle events, while Dave Bishop won the 200 yard Individual Medley and 400 yard Freestyle. The Basketball team, led by Jim Wimpress' 17 points, beat Madison Memorial 62-55 at the Case Field house. The play "See How They Run" will be presented by the Case High School Drama Department this evening, Thursday and Saturday in the Case High Theatre. 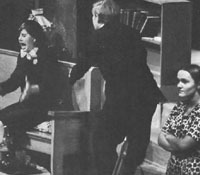 The cast include Jacci Van Allen as Ida the maid; Debbie Smith as Miss Skillon; Bob Gailbraith as the Reverend Lionel Toop; Laurie Chobanian as Penelope Toop (the Reverend's wife); Bob Heinrich as Corporal Clive Winton; Eric Smithback as the intruder; James Tenuta as the Bishop of Lax; Glen Christianson as the Reverend Arthur Humphrey; Charles Turner as Sergeant Towers and Todd Mittag as Willie Briggs, a choir boy. Show time is 8:00 PM. Tickets ar $1.00 at the door. School officials are considering canceling Park High Schools's entire athletic program following disruptions after a basketball game last night at Park where Case beat Park in a standing room only thriller 64-62. 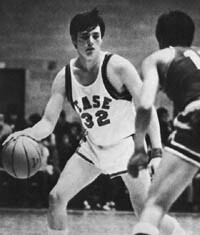 Case was led in scoring by Junior Donnie Snow with 21, Jim Wimpress with 14, Phil Stewart 13 and Ed Mitchell 11. 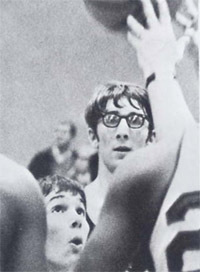 Gary Cole had 29 points to lead Park. Racine Police said they were struck by flying bricks. Racine got hit with 9 inches of snow which began yesterday afternoon and ended early this morning. 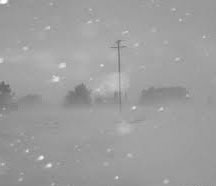 Racine Street Superintendent Hebert Brouillette said "This is the most snow we have had in a 24 hour period in 5 years. School was not cancelled. The case Gymnastics team had an easy win of 81.97 to 24.35 ove Kenosha Bradford yesterday in their season opener. 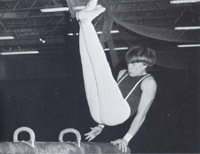 For Case, Tom Gianforte was named all around winner, Scott Peterson and Jeff Wade were double winners while Dale Pope took the Side Horse Competition and Todd Hansen took the Parallel Bars. Senior guard Ed Mitchell hit a 35 foot jump shot at the buzzer as the Case Basketball team beat the Horlick Rebels 54-52 tonight at the Horlick Field house. Case's record is now 3-0 while Horlick's record is 1-1. 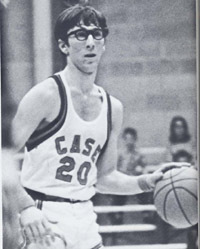 Case's Mark Peccarelli added 12 points. A-ABC Driving School located at 609 Sixth Street, is offering a high school Christmas special for Case High School students. The complete course (Theory and Behind the Wheel) for $65.00. Offer end December 31. The famous rock band THE LINES END members are all students from Case High School. 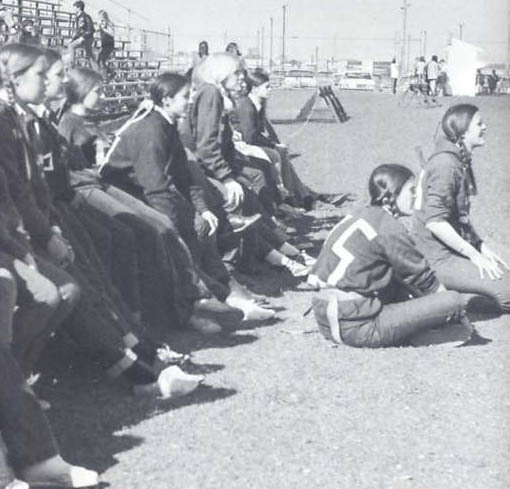 Their fame started when they won the 1969 the local Jaycee “Battle of the Bands. They donated their winning plaque to Case High School. 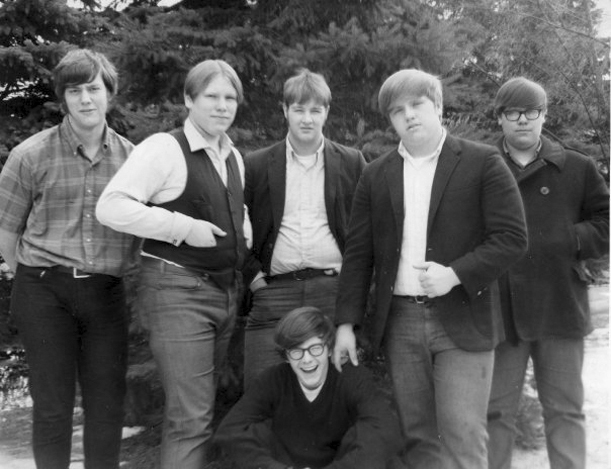 Members (from left): Dennis Roslansky, vocals and bass guitar (class of 1970), Gary Lekas, organist (class of 1970), Chris Inloes, vocals and lead guitar (class of 1971), Mike Thibeau, lead vocalist and bass guitar (sitting, class of 1971), Rocky Rockwell, rhythmn guitar (class of 1970) and Bobby Lekas, drums (class of 1969). Their fame has brought them to venues in Chicago, Milwaukee, Sturtevant, Northwestern University and many locations in Racine: The Sound, The Happening, The Nitty Gritty, The Release and Memorial Hall. Band Battle Dance tonight plus WOKY's Bob Barry. 8:00-11:00 PM at Memorial Hall, 7th and Lake Ave. $1.50 for members of the Lompri Dance Club, $2.00 for non-members. Lompri Productions, 8700 Racine Ave, Sturtevant. Jim Lambardo and Dave Nimmer - Co-Owners. 886-3561. The Case Basketball team was handed its first loss of the season last night, 79-57, at the hands of the undefeated Neenah Rockets at Neenah. Ed Mitchell led Case with 12 points, Junior Tim Shalbrack added 10. Case's record falls to 8-1. 1970 Graduate Harold Rasmussen (graduated 7 months ago from Case High School) gained great recognition for his superb talent as a pitcher. He is selected by the Boston Red Sox in the fourth round of the free agent draft to go PRO. 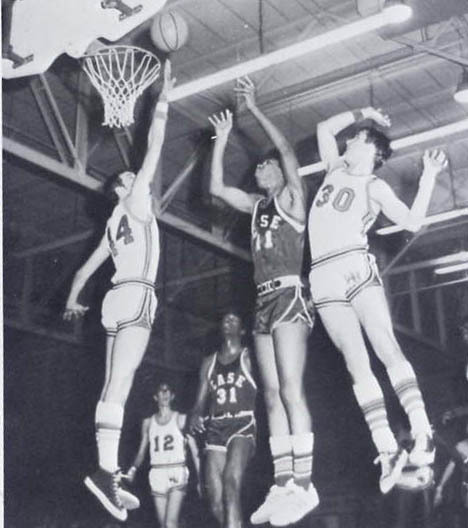 He opted instead to attend the University of New Orleans, where he was named first team All-America. (He would later change his name to Eric Rasmussen, a name that would be famous in a long career in professional baseball). Behind the enthusiastic cheers from Wrestling cheerleaders: Nancy Clementi, Brenda Hammill, Karen Muffick, Candy Ackerman and Val Bien, the boys wrestling team wound up its dual meet schedule yesterday with wins over Whitnall 42-6 and Wauwatosa East 47-3. Heavyweight Bill Lui finished the dual schedule unbeaten with a 16-0-1 record. 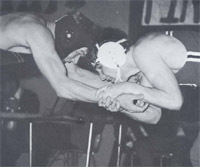 Rick Schoeffler at 167 lbs. 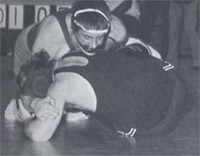 had a record of 16-2 and Dan Daniels at 145 lbs. with a 13-2 record. 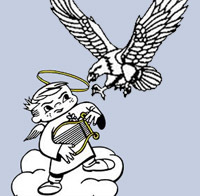 The Case Eagles basketball team has moved into the top 10 in the state this week tying Glendale for eighth place. The eagles are 13-1 and have 39 votes. St. Catherines is ranked number two with 15-0 and 148 votes. Neenah is number one at 14-0 and 166 votes. Case finished its dual swim season yesterday with the enthusiastic support of swim cheerleaders: Sarah Thompson, Diane Mulvey, Sue Conrady and Mary Walter. They defeated Menomonee Falls East 49-46. 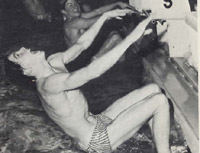 Double winners for Case were Dave Bishop, 200 yard freestyle; Rob Bauman, 200 yard freestyle and 100 yard butterfly and Ken Sorenson in the 50 and 400 yard freestyle events. Case Senior John Valko Jr., son of Mr and Mrs John R. Valko, Sr. of 2706 Brentwood Drive has recieved an honor for his service as a carrier at the Journal Times. Case Senior Larry Zogrodnik, 17, son of Mr and Mrs Duwayne Zogrodnik, 4225 Sheridan Road, was one of two Racine young musicians who were finalists in the Fourth Annual Young artists in Milwaukee yesterday. Zogrodnik is a Violinist. The other finalist was Horlick Senior Robbie Plate. The Case High Drama Department will be presentng "Menagerie" tonight through Saturday at Case. The cast includes: Paul Bradley as Tom Wingfield, Linda Downman as Amanda, Karla Widner as Laura Wingfield and Bob Heinrich as Jim. Show time is 8:00 PM and tickets are $1.00 at the door. 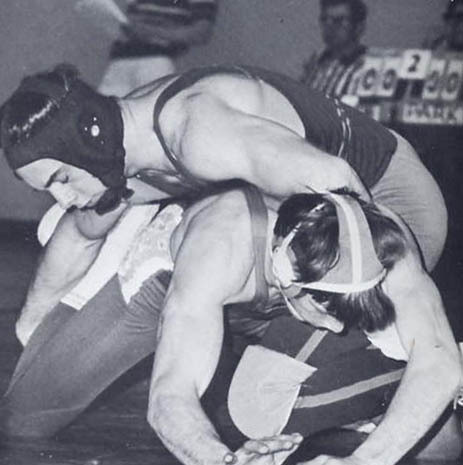 Case's only Saturday night entrant, Ross Anderson, reached the semi-finals, lost, then lost on a wrestleback in the 185 lb. division. Park's Frank Valaquez became the only wrestler in Racine history today in win 3 straight State Championships in the same weight class - 98 lbs. Case's basketball season sadly ended last night with a 74-62 upset loss to Park in the Regionals. "We beat them twice during the season, but couldn't get much momentum tonight", according to Case Coach Don Schutt. Phil Stewart led Case with 17 points and Mark Peccarelli had 7 rebounds. Case ends the season with a 16-4 record. Case Seniors, Bernadette Renpaul and Renee Mertins are 2 of 8 candidates who will be picked as the Teen Queen at the Racine Home Show which runs from tomorrow through Sunday at Memorial Hall. Case High Track and Baseball Teams will hold their practices today in the Field house. The track team will practice at 8:30 AM and the baseball team will hold drills at 11:00 AM. Track is coached by Orby Noss and Baseball by Tom Brandon. 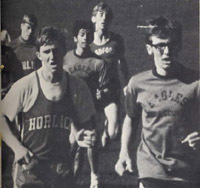 The Eagles opened their 1971 track seasons today at home with a triangular win over Nicolet and Fort Atkinson. 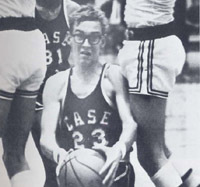 Case had 66 points. Nicolet 46 1/2 and 35 1/2 for Fort Atkinson. The Case baseball team opened their 1971 season with a 10 inning 3-2 win over Park. 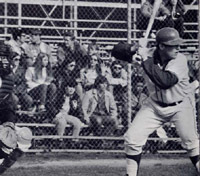 Ken Pratt was the hero as he batted in a pair of runs in the bottom of the third and drove in the winning run the tenth. Case Senior, Joe Sabol will represent the Amvets Columbia Post No. 120 today in Oshkosh, in the Wisconsin Driver Education program for high school students. Sabol is the son of Mr and Mrs Joseph Sabol, 6328 Washing ton Avenue. 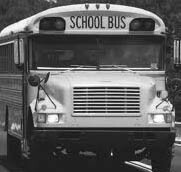 The Board of Education voted today not to fund the after school activities bus beginning with the 1971-72 school year. The bus currently serves Case and Horlick High schools. Also Gifford, Jerstad Agerholm and Starbuck Junior Highs. The Case Golf team started their season with a win yesterday over Franklin 669-783. Jon Elbin fired a 78. 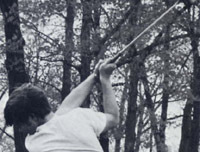 Rick Naleid, Wayne Vinkavich and Rick Geshay all shot 83 for Case. Case Senior, Pam Treiber will perform a piano recital at Calvary Memorial Church today at 3:00 PM. Pam is the daughter fo Mr and Mrs Erdman Triber. Her program will include a Beethoven Sonata, short pieces by Ravel and Tcherepnin, two pieces by Brahms and will conclude with the "Fantasy of Hungarian Themes" by Liszt. The Case Tennis team launched its season with a 5-0 win over Burlington today. Winners were: Jim Fumo, 6-1, 6-2; Tom Eggers, 6-2, 6-3 and Mark Zettel, 6-0, 6-1. Doubles winners: Dale Pope/ Dave Nimmer, 6-1, 6-2. 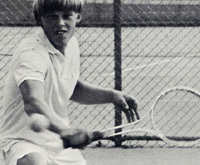 Ron Jones/ Bob Coltman, 7-5, 7-5. 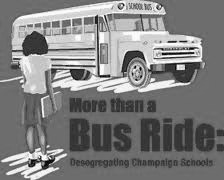 An unanimous Supreme Court upheld today that Federal Courts may order busing of public school students as a means of desegregating schools. 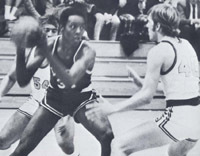 Racine's Case and St Catherines will meet in four sports, including football and basketball, beginning with the 1972-73 school year, it was announced this morning. 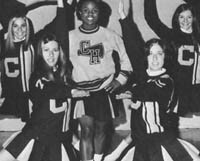 The two schools have never competed against each other. Case Senior Toni Haman has been awarded a $500 "Special Merit Scholarship" by Bradley University for the 1971-72 school year. Miss Haman finished in the upper 10 percent of her class. She is the daughter of Mr and Mrs Alvin Haman, 6441 East River Road. Case High School won the Lighthouse trophy for the first time in the school's history today due to an 8 inning, 6-5 baseball win over Horlick at Horlick Field. Steve Mulvey went the distance for Case striking out seven. Pete Putra's single in the bottom of the eighth drove in Les Kolls from second with the winning run after Rick Palmer sacrificed Kolls to second. The Case girls track team tied for second place at the Girl's WIAA State Track Meet in Appleton today. 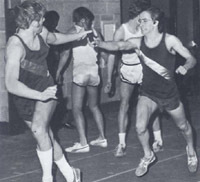 Case runners won two events: Kelli Koltyn was first in the 880 and the Eagles' 880 Medley Relay team of: Sandy Kingsfield, Candy Ackerman, Kelli Koltyn and Betsy Folwell set a new meet record of 1:55.4. Reedsburg took first place with 17 points and case tied Madison West for second with 14 points. Senior Tom Cook was named as Case baseball team's Most Valuable Player today at the Annual Awards Banquet. 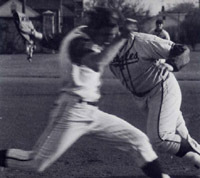 Cook, who plays first base, led the team with a .432 batting average (16-37) and finished second in the city behind St. Catherine's Bill Betsch who batted .465 (20-43). Case High School honored dozens of its top students last night in two separate assemblies. Senior speedster, Dave Manderfeld, set a new state record in the 220 yard dash at the WIAA Sectional Track Meet at Oak Creek today. 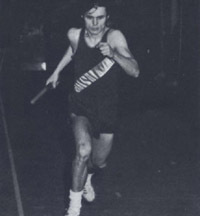 Manderfeld's time of 21.3 was one-tenth faster than previous record time. 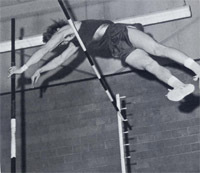 Along with Manderfeld will be Tom Gianforte and Dave Nelson, who placed 1-2 in the pole vault, going to the state Track Meet this weekend in Monona Grove. Racine Police cited more than 50 teenagers last night for curfew violations as they were "hanging out" around Monument Square area, downtown. According to one source, "Something like this was inevitable, with the weather improving and school almost over, all the kids are driving downtown 'Scooping The Loop". Case finished with seven points over the weekend at the State Track Meet in Monoma Grove. Case ended up in tenth place. 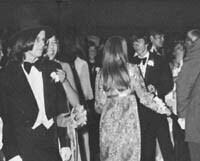 The Racine High School Prom was held last night 'til 6:00 AM this morning. 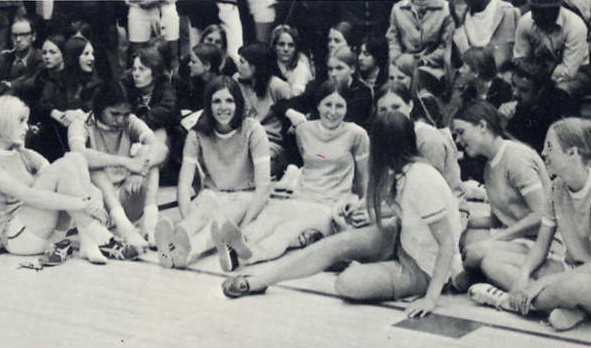 Case was the first school to arrive at Memorial Hall around 11:00 PM and other schools followed every 30 minutes. Music was provided by the Black Society, The New Colony Six and the Edon Stone Band. 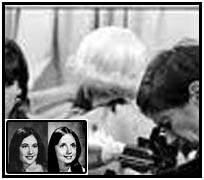 Kim Dykstra and Pattie Klyzub were Case's King and queen. More than 1500 Seniors and their dates attended. J. I. 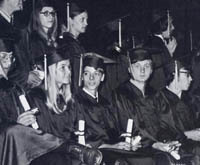 Case High School Class of 1971 Graduation!